Sometimes it’s hard to find the perfect carbine hook you need – and that’s where we come in. Whatever job you’ve got in mind, if you’re looking for a reliable and fantastically strong formed carbine hook with eye then take a look at Rope Services Direct. Sometimes referred to as a Karabiner, carbine hooks have a spring gate that you push to open and release to close. This gate is then kept in place due to a groove in the metal which the spring pushes against to keep it closed. Additionally there’s an eye to keep the rope steady and prevent it moving up. Swift to use, they’re good for commercial and industrial purposes as well as in the leisure industry. 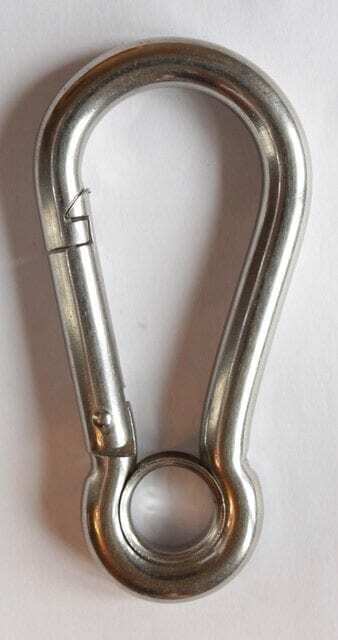 All our carabiners are created with a marine type stainless steel meaning they’re great even in rough conditions. Not just offering outstanding weather-proofing, it also provides all sorts of solutions in pursuits such as sailing, hiking, skydiving, climbing and mountain walking. They’re great for fibre ropes too. Available 6mm, 8mm, 10mm and 11mm across. From our extensive base near Birmingham, we offer carbines for just about everything. Whether you’re looking to secure it to a winch rope or one of our braided ropes, you are pretty much guaranteed to locate the exact carabiner hook you require. To place your order, all you need to do is fill in a request here. If you’ve got a burning question or there’s something you need us to clarify, feel free to get in touch with one of our friendly team on 01384 78004. Formed Carbine Hook With Eye Overall rating: 5 out of 5 based on 6 reviews.